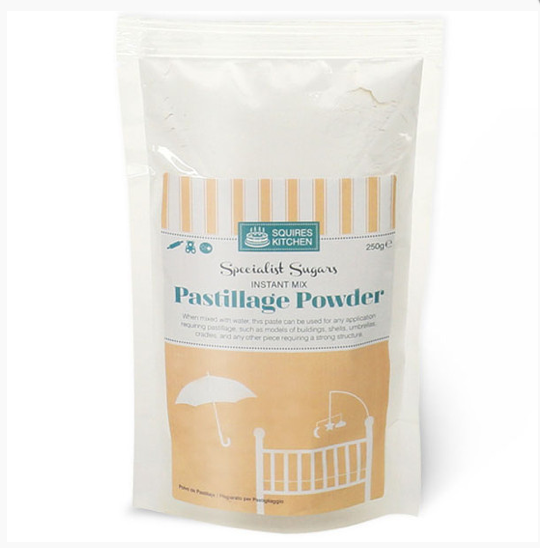 Pastillage is a strengthened paste which is recommended for creating structures such as buildings, models, ornaments as it is very strong and hard when dry. It is available in a convenient powder mix to which you just add water. Mix the quantity you wish to use with required amount of water and knead well. To colour it, just add a concentrated paste colour and knead in. Roll out to thickness required (as thin as possible) and cut out taking care not to drag your knife through the paste, as this could cause wrinkles in your paste! This is a paste that dries out very quickly when exposed to air so keep well covered whilst working with it! You do need to work as quickly as possible with it! You can ‘polish’ the paste with the palm of your hand to smooth the surface! It should be left to dry for a minimum of 24 hrs at room temperature, depending on thickness/ shape/ size of pieces. TIP! Place on sponge to dry so that the air can circulate over top and base of paste and therefore help it to dry evenly. If only one side dries at a time there is a tendency for it to warp/buckle. It is a good idea to turn it over every few hours while drying anyway. Use royal icing to fix pieces together, supporting them until dry. TIP! If any have rough edges, use an emery board to remove them! Re wrap any surplus and keep airtight in a plastic bag. It can be frozen. Store finished items where the air can circulate, either in a cardboard cake box or display cabinet. They should keep for several years!